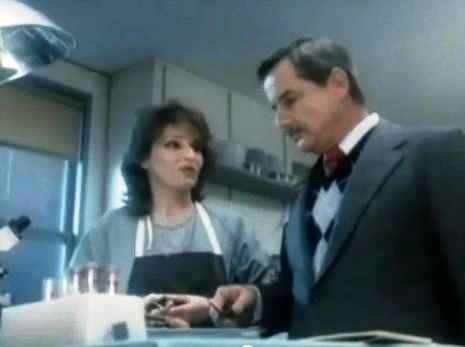 Mrs. Hufnagel checks out of St. Eligius one last time, and William Daniels picks up an Emmy. the bed for Mrs. Hufnagel (Florence Halop). In Edward Copeland's 30th anniversary retrospective, this section covers the show's most memorable recurring character, the acid-tongued patient who just wouldn't go away, Mrs. Hufnagel (Florence Halop). The show's writers had come to love writing the "Hufnagel Spot" in each episode, delighting in spinning out insult after insult at the expense of the show's main characters. At this point, she's been re-admitted at least six times, each time with a more serious ailment. But the show's medical adviser insisted that in real life, a patient spending that much time at a hospital would have one of two fates: either she'd get better and be gone for good, or she'd succumb to her illness(es), and be gone for good. Left to the whims of St. Elsewhere's writers, the choice was clear. In "Murder, She Rote", Mrs Hufnagel is recovering from open-heart surgery to repair an aneurysm. She buzzes the nurses' station, where Nurse Lucy Papandrao (Jennifer Savidge) is loath to answer yet another call from the abrasive patient. Hufnagel had been trying to adjust the bed so she could sit up, but like most things at St. Eligius, the bed malfunctioned. In her annoyance, she addresses Lucy as "cretin," but then covers by claiming she was referring to Nurse Papandrao's ethnicity, as her descendants hailed from the Isle of Crete. After calling the Greeks "a distrustful lot" and getting a shot in at Aristotle Onassis, Mrs. Hufnagel does something uncharacteristic: she thanks Lucy for the help. 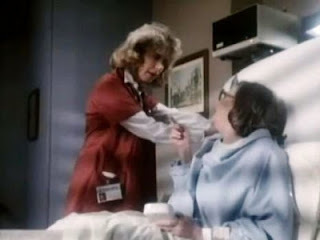 Her bed has malfunctioned again, this time at the foot end, when Dr. Victor Ehrlich (Ed Begley, Jr.) arrives to check up on the post-op patient. You know she's not doing well when she mistakes the pale blond doctor for his colleague, Dr. Philip Chandler (Denzel Washington), and says her chest feels "like Buddy Rich's snare drum." Victor needs to check her potassium levels, but Hufnagel refuses to be pricked with a needle, and then confuses her doctor for a former regular customer at the diner she owned with her husband (called Flo & Eddie's). She complains about the food, which she claims is causing the bubbles in her head (like Lawrence Welk). Ehrlich, already late for rounds, loses his last shred of patience and leaves, her potassium levels unchecked. Once again, we see Nurse Papandrao get another buzz from Hufnagel's room, but this time she ignores it. Orderly Luther Hawkins (Eric Laneuville) is making the rounds, collecting garbage. This sets up one of St. Elsewhere's most memorable images -- this time, her bed malfunctioned on both ends, and she's trapped in the folded-up bed. But she's not moving. Luther checks her pulse and her arm goes limp, call button still in hand. Finding no heartbeat, he calls a code. When we return from the act break, it's official -- after 17 episodes and 40 minutes of resuscitation efforts, Mrs. Hufnagel is dead. 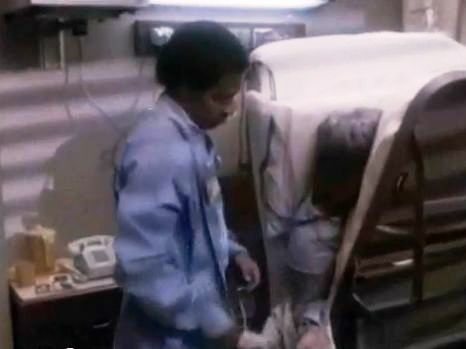 On the way to the morgue, Luther informs Dr. Mark Craig (William Daniels) that one of his patients has passed away. When Luther explains that her cardiac arrest may have been triggered when she was swallowed up by the bed, Chief of Services Dr. Daniel Auschlander (Norman Lloyd) can't help but burst into laughter. Dr. Craig doesn't find losing a patient so funny. Director of Medicine Dr. Donald Westphall (Ed Flanders) agrees that the case had been manhandled from the start, but Craig goes a step further -- she "was murdered, same as if she'd been knifed in an alley," and he is determined to see that the guilty parties pay. In surgery, Dr. Craig tells Ehrlich that he didn't see notes on Hufnagel's chart and informs him that she died ("with a snarl on her face...crushed by her bed like a clam," adds anesthesiologist Dr. Vijay Kochar (Kavi Raz)). Craig doesn't accept Victor's excuses for not cutting through his patient's anxiety and checking her potassium levels, and Craig hasn't ruled out Kochar as a suspect, either. He warns them that they'd better have their alibis together at the mortality conference. Dr. Jacqueline Wade (Sagan Lewis) and an unnamed pathologist perform Hufnagel's autopsy, and Jackie admits that for the first time, she doesn't care about a patient dying. She has found what likely caused her cardiac arrest -- the papillary muscle ruptured. When she reminds Dr. Craig that he nicked it during surgery, distracted by Ehrlich whining about cake frosting, he is aghast at the suggestion that he had made such an error. He insists that it must have been a pre-existing defect, and that the post-op notes he dictated after the procedure will reveal the truth (in his mind, that it must have been Wade who did it). Later in his office, he listens to the tape. After jumping ahead a few times, he hears his own voice say the words he didn't want to hear: "detected small surgical nick on the mitral papillary muscle..." After ducking a phone call and re-listening a couple of times, he pulls the cassette out of the tape recorder and destroys it. He tries to go about his work, but he can't forget what happened. The mortality conference begins, and Dr. Annie Cavanero (Cynthia Sikes) feels like she's in an Agatha Christie novel where everyone is a suspect. Ehrlich offers remorse for ignoring Mrs. Hufnagel's distress when he last saw her, but Dr. Craig is unusually forgiving (though he does tell Kochar, a frequent target of his abuse, to "book a passage to India"). After Dr. Chandler presents the first case, the matter of Mrs. Hufnagel's death is raised. Mark insists on handling it himself. Here's the clip of Mrs. Hufnagel's blackly-comic end, Dr. Craig's determination to find who's to blame, and (at the thirteen-minute mark) the mortality conference where he must face the music. Ladies and gentlemen, your 1985 Emmy winner for Outstanding Lead Actor in a Drama Series, William Daniels. What I love about this story is that Dr. Craig insisted that he would give hell to whomever was responsible, and despite his ego, he holds true to his word. He may be brutal and demanding, but I have to respect him for eventually fessing up and holding himself to the same standard he holds others. Some trivia, and by "trivia", and I mean trivial... The case Dr. Chandler presents at the mortality conference refers to the death of one Jeffrey Sagansky, a 32-year-old executive who collapsed in his screening room on Friday night between 8 and 10. I did a bit of research to figure out this joke. Jeff Altman, Mitsuyo Nemoto and Keiko Masuda, a.k.a. Jeff Sagansky was the network TV whiz kid who served as NBC's Senior VP of Series Programming from 1982 to 1985. Under the guidance of CEO Grant Tinker (co-founder of MTM Enterprises with his wife Mary Tyler Moore) and especially President of Entertainment Brandon Tartikoff, NBC went from being the last-place laughingstock that gave the world Supertrain and Pink Lady in 1979 to the home of classy fare like Hill Street Blues and The Cosby Show, while still pleasing the masses with the likes of The A-Team and Knight Rider all the while. In the 1982-83 season alone, NBC launched the 80s classics Cheers, Family Ties, St. Elsewhere, Remington Steele, The A-Team, Knight Rider, Silver Spoons and Mama's Family. None of their new shows the following season survived, but they struck gold with The Cosby Show in 1984-85. That pushed them into second place, and the peacock network reached first the following year. Tartikoff and company had their misses, too (like Manimal, or the decision to cancel Buffalo Bill). One of those weak spots was NBC's 1984-85 Friday night schedule, which featured two new series: the sci-fi fantasy V from 8 to 9, and the violent police action-drama Hunter from 9 to 10. V turned out to be a major flop with critics and viewers--not good when you're making the most expensive series ever produced at the time, at a cost of one million dollars per episode (and yet still filling it out with stock footage). Hunter had the misfortune of being scheduled against CBS's juggernaut Dallas, but halfway through the year, executive producer Stephen J. Cannell held a private screening of an unaired two-part episode for Tartikoff in an effort to convince him that the show needed more time to attract viewers. The network boss agreed, put the show on hiatus for two months, and brought it back on Saturday nights, where ratings slowly began to climb. The following year, the show was retooled and became even more popular, and it stayed on the air for seven seasons. 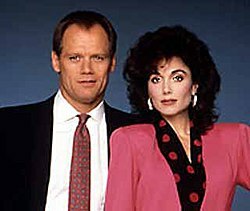 Hunter's Fred Dryer and Stepfanie Kramer. I'm guessing the in-joke is that the writers felt that Sagansky's position at NBC became untenable after Cannell convinced Tartikoff that Hunter deserved another chance in a better time slot, coupled with the disaster that was V, or something like that. Things worked out just fine for Sagansky, though; he left to become President of Production and later President of TriStar Entertainment. One of my goals with this blog is to tell the stories behind these quirky, arcane references. Why? Because I can. Thank you, Internet. For me, St. Elsewhere was the Ulysses of television. Just substitute a baby boomer's television-filled youth for literature.